Balzer + Bray, 9780062310880, 304pp. 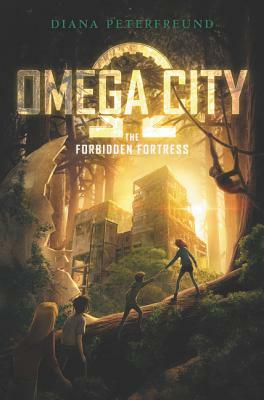 Perfect for fans of The Goonies and Rick Riordan, The Forbidden Fortress is the thrilling sequel to Omega City, from acclaimed author Diana Peterfreund. Gillian Seagret is not having a great summer. Her mother’s come back with plans to move Gillian and her brother across the country, and her father is away promoting his new book on Omega City—without her! Though Gillian and her friends were the ones to find the lost doomsday bunker, no one seems to care about their thoughts on the whereabouts of its creator, Dr. Underberg, or learning the truth about the Shepherds, a mysterious group that will stop at nothing to keep Underberg—and Omega City—a secret. All that changes when Gillian and her friends are invited to speak at a lecture series at Guidant Technology. Finally they’re being recognized for their adventures! The Guidant campus is full of wonders, from self-driving cars to robot waiters, and the future-focused employees seem like worth heirs to Dr. Underberg. But there are secrets here, too—a radio station that plays nothing but coded numbers, and an island that doesn’t appear on any map. And when Gillian and her friends uncover evidence that the Shepherd conspiracy goes deeper than anyone suspected, it’s up to them to infiltrate the Shepherds’ secret base and expose them . . . before it’s too late.